2.1. What is Private Equity? 2.2. What is a Leveraged Buyout? Private equity is currently replacing hedge funds as the most observed asset class. And while mutual funds experience a decline of assets under management, buyout funds break all records as far as fund raising is concerned. The attractiveness of buyout funds among investors is often attributed to superior returns and to an allegedly lower correlation with other asset classes. However, buyout fund returns also show superior volatility. In addition to that risk factor, investors must face liquidity and transparency risk. It is common agreement that investors are compensated for the elevated risk through a return premium. This and the cited lower correlation prompt more and more investors to add private equity into their portfolios. The wide-spread opinion of superior private equity performance is backed by several studies. But the analysis of these studies reveal that a number of them employ methodologies which are disapproved of by experts on theoretical private equity performance measurement. Furthermore, some have a one-sided notion of financial performance. Benchmarking, risk and correlation data which are crucial for an overall performance assessment often lack. The analysis of a series of technically appropriate, objective studies shows that private equity has historically outperformed public equity with regard to returns, in Europe more than in the United States (US). What remains unsolved is to which extent this return premium rewards the inherent, additional risk of private equity investments. And what is more certain: the prevalent view on correlation seems to be wrong. Empirical evidence and qualitative analysis speak for high correlation between private equity and the major asset classes. The most important driver for individual fund performance appears to be the quality of fund management. Thereby, specialized teams outperform others. Moreover, specialized funds provide investors better opportunity to diversify their private equity portfolio. Fundraising and investment conditions for private equity funds in France and Germany are favorable, but the accomplishment of superior performance will become harder in the future. The rules of the private equity business are changing as operating leverage has replaced financial leverage as the essential value driver. Whereas triggering the operating lever will become more difficult, exit conditions continue to improve. Selection of top-performing funds becomes even more crucial for investors due to an expected widening of the performance gap. Most people will agree that „private“ is more attractive than „public“. The use of private jets is more convenient than flying public airlines, private parties are more promising than public parties, private health insurance provides better service than public healthcare and private schools often open up more opportunities than public schools. Observing the financial world, the impression is received that the same holds true for equity. Public equity has gambled away a lot of trust in the eyes of the investor community since the crash of the new-economy-boom in 2001. Although stock markets have partially recovered, certain suspiciousness has remained, indicated by the ongoing difficulty that investment banks face when they attempt to execute initial public offerings. Private equity, in contrast, enjoys great popularity. New funds are being established, more and more US funds arrive on the European scene, fund-raising even for multi-billion funds is completed in minimum time, debt is cheap and financing alternatives are abundant, many graduates and young professionals wish to pursue a career in private equity and aversion to leveraged buyouts in the public has been diminishing. Private equity shares this favorable fate with other alternative asset classes like hedge funds. Low correlation of performance with other asset classes such as stocks and bonds as well as superior returns are most often cited as reasons for this run on alternative investments. However, return is only one side of the medal; the second component of performance is risk. And risk is difficult to measure in markets where liquidity is low and information scarce. The following questions arise: How is overall performance of private equity to be measured? Which insights has research yielded on past performance? Which factors drive private equity returns and explain performance differences amongst funds? What are the prospects for the future? Is the macroeconomic environment favoring success? Can practical recommendations be deduced for private equity executives? This paper explores the issue and implications of private equity performance from a theoretical and practical point of view. It attempts to find answers to the questions raised above. In order to achieve this objective, the following structure has been chosen. In the first part, a comprehensive overview of the private equity business is given. The mechanisms of the business model are analyzed, the basic functioning of a leveraged buyout is explained, the involved parties and their roles and interests are presented and finally, the triggers that private equity funds pull to create value for their investors are portrayed. The goal is to familiarize the uninformed reader with the business model from different perspectives and to communicate the dynamics and stakes of the business. The second part is dedicated to private equity performance itself. First, investment performance measurement theory in general is introduced and then applied to private equity. Actual studies on the performance of the asset class are analyzed and conclusions are drawn on the relation between theory and practice. Implications for private equity funds are discussed. Second, the perspective is changed from the overall asset class to the performance of individual funds. Success factors of top-performing funds are supposed to be identified and again, recommendations for funds discussed. The objective of the second part is the assessment of the performance of the asset class private equity and the identification of performance drivers. In a third step, the macroeconomic environment in which private equity funds are operating in Germany and France is evaluated. The most important factors impacting the possibility to trigger the value-creating levers are analyzed. Success factors such as the legal and fiscal environment, Basel II, the fund raising situation, investment opportunities, competition amongst funds, financing alternatives and costs and exit alternatives are assessed. At the end, the reader should be able to form a qualified opinion about the outlook for private equity in Germany and France. Ultimately, this paper aims at assembling and contrasting the research on the question of private equity’s overall performance relative to other asset classes. Furthermore, implications are to be transferred to the actual market environment of private equity funds today. 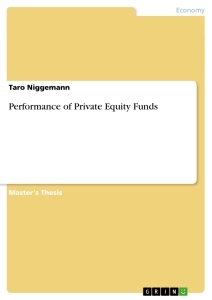 Thus, the reader becomes acquainted with the handicaps in private equity performance measurement, the current status of research on past performance and prospects for future performance. Finally, the reader should know which developments are crucial success factors in Germany and France and are therefore to be closely followed. In the following, the asset class “private equity” is introduced. After a general portray of the private equity market, the most common investment form, the leveraged buyout (LBO) is explained. Then, the different parties involved in the investment process of an LBO are described with regard to their individual roles and interests. The next part characterizes the financing of an LBO with the three general sources of funds: equity, debt and mezzanine. Finally, the three value-creating levers in an LBO are presented: financial leverage, operating leverage and market timing / exit multiple. The term “private equity” depicts the fact that, next to the public equity markets, i.e. the widely known stock markets, there is also a market for private equity. In this case, ownership shares in a company are not transferred by means of public quotations, but through private, bilateral negotiations. Thus, the term already includes the two main characteristics of this market. First, we are dealing with an equity investment product. This yields insights into the expected return and the risk of this investment type. Second, the market is private which means that information is scarce and the market is largely intransparent. Before evaluating the impact of these two characteristics, private equity will be positioned in the general investment universe. Private equity is commonly referred to as a sub-class of the asset class “alternative investments”. Alternative investments are complimentary to the stock and bond portfolios traditionally used by investors. Other alternative investment forms are hedge funds, real estate, physical commodities, natural resources, currencies and interest rates. Private equity has become a major component of the alternative investment universe and is now broadly accepted as an own established asset class within many institutional portfolios. Private equity itself can be divided into venture capital, buyouts, special situations and mezzanine capital. This categorization indicates that private equity does not always come in the form of “pure” equity but also as a hybrid form of financing, i.e. mezzanine, or even in the form of debt as in special situation investments. Furthermore, it shows that, in general, private equity investments are placed at any stage of the life cycle of a company. Venture capital is provided in the seed or start-up phase of a company, buyouts are most often conducted in the expansion or maturity phase, whereas special situation investments typically relate to turn-around cases, i.e. companies in financial distress. However, the analysis in this paper places emphasis on the buyout market, which constitutes the largest out of the four segments and is most often associated with private equity. The backbone of the buyout markets are buyout funds. Buyout funds are temporary, financial holdings that collect funds from investors and invest them in operating businesses, so-called target companies. The most common legal vehicle for buyout funds is a limited partnership, a structure that treats every investor, i.e. limited partner, as a partner investing directly in the target companies. This structure is entirely tax driven, designed to avoid the double payment of capital gains tax which would arise from using a corporate investment vehicle. The general investment philosophy consists of buying shares in the target companies in the first years of the fund’s life, which typically lasts from seven to ten years. Towards the end of the fund’s life, the investments are “exited”; the parts are sold, preferably at a gain. Consequently, funds are returned to the original investors. The structure of the funds is normally closed-end, meaning that the investor has very limited or no ability to withdraw his investment during the fund’s life. Although the investor may receive cash distributions during the fund’s life, the timing and volume of these payments is uncertain. With liquidity risk being one of the principal risk factors of this asset class, private equity should therefore be viewed as a longer-term investment strategy. The lacking liquidity is the principal disadvantage of private equity compared with public equity. What are then the advantages which compensate for the illiquidity and which have let private equity become a competitive asset of stocks? The fundamental rationale to invest in private equity is to improve the risk and reward characteristics of an investment portfolio. Thus, investors hope to generate higher absolute returns while reducing risk by improving portfolio diversification. How is this achievable? Diversification is accomplished through the combination of non-perfectly correlated assets into a common portfolio. While the exact, technical explanation of the impact of low correlation on overall portfolio risk will be postponed to chapter 3.1., it is sufficient to mention here, that most scholars acknowledge a diversification effect of including private equity in a portfolio dominated by stocks and bonds. Now, that we have seen that private equity can have a beneficial impact on the overall risk-return performance of an investment portfolio, we will look at private equity’s individual relationship of risk and reward. The reader will find out in this paper that this relationship is attractive. According to the majority of scholars, private equity has not only a “right to exist” as a valuable portfolio component because of its allegedly low correlation with other assets but also as an independent asset class because of its auto-performance. Equity returns are in general more volatile than returns from debt investments. Returns on private equity investments are regarded as being even more volatile than returns on public equity. Risk, expressed through volatility of returns, is therefore relatively high. Compared to mutual funds, private equity funds only invest in equity and they often invest in relatively concentrated portfolios; there are approximately only 15 companies in a typical buyout portfolio. In addition to volatility, there is the low liquidity of the funds invested in private equity and the opacity of the investment as already mentioned before. The investor wishes to be compensated for these inconvenient factors, of course. Thus, investors expect a high rate of return, in return for the risk they accept. Different studies yield different results; however, it is common agreement that private equity has historically outperformed public stocks in Europe and the US with regard to returns. In fact, it is this higher return on investment realized in the past, representing the additional risk premium which limited partners demand, which has resulted in an individually attractive, overall performance of the asset private equity so far. I have just stated that private equity investments are risky. Why is this so? A private equity investment is a two-step equity investment. First, the limited partners provide equity to the private equity fund which is managed by so-called general partners. The fund uses this money to acquire equity stakes in target companies. According to general finance theory, any equity investment is risky. But what explains private equity’s particularly elevated volatility compared with the stock markets? The term which is assigned to investments of private equity funds reveals the secret: leveraged buyout. The acquisition of stakes in a target company is only partially financed by the fund’s equity; a large proportion is financed by debt. And as we know from financial theory, debt provides leverage: it boosts returns in both directions, positively and negatively. Leverage is a key element of the private equity business model and explains the higher volatility. How is an LBO organized? An LBO implicates the acquisition of a significant proportion or majority control of a business which normally entails a change of ownership and management. Buyouts often involve the set-up of a financial vehicle between the buyout fund and the target company. This holding, generically called “NewCo”, holds the debt and mezzanine used to finance the acquisition. It makes the interest payments and pays off the principal with the surplus cash flows generated in the target company and provided to the holding in form of dividends. Figure 2.1. illustrates the set-up of a typical LBO. The role of each entity is described in greater detail in the following chapters. The organizational structure of an LBO implies that any cash generated in the operating business is “squeezed out” of the target company, transferred to the NewCo and then distributed to the different investors. The practices used by buyout funds to generate this cash have stirred negative emotions amongst target companies’ stakeholders such as the employees or the general public in the past. Investment cases that rely predominantly on streamlining and cost cutting are called “diet deals”. Such aggressive deals, sometimes involving a hostile taking-private, the lay-off of employees and the dismissal of the incumbent management, have shed negative light on the whole industry. However, the freedom of private ownership admits drastic changes in management because there is no reaction from capital markets to be feared. All decisions are facilitated, certainly unfavorable ones, but also other, long-term investment decisions for example, that “regular”, listed companies cannot make due to quarterly reporting pressure. Radical asset sales, a practice also referred to as “asset stripping” has been applied in the largest and most notorious LBO so far, the taking-private of RJR Nabisco in 1988 through KKR. However, this example cannot be generalized. It can be generalized though, that the investors try to maximize the value of the target company during the investment period. And the calculation of value is based on the future business prospects of a firm. These in turn depend on productive assets and employees and on financial health. Therefore, most buyout funds use short-term value-driving actions with care and strive to create healthy and prosperous companies with a sound basis for profitable growth. Some experts even argue that buyout firms outperform their peers as far as investments, spending for research and development and new employment are concerned. As a conclusion to this issue it can be stated that the impact of private equity on different stakeholders varies from case to case. The overall consequences of buyouts are still discussed vividly. It is certainly true however, that LBOs increase the efficiency of capital employment in an economy. The limited partners stand at the end of the “food chain”. They are the principals of the general partners; they provide the capital which starts the investment process. Who are these investors? The spectrum of investors in private equity includes numerous different investor types. Institutional investors such as pension funds, trusts, endowments, insurance companies, banks, governmental and non-governmental organizations but also high net-worth individuals are amongst them. “The percentage of endowments/foundations, corporate and public pension plans in North America with an allocation to private equity increased from 64% in 2001 to 70% in 2003 with their average allocation increasing from 7.5% of assets to 8.2% of assets. Progressive university endowments such as those of Yale, Harvard and Princeton allocate as much as 15-20% of their endowment portfolios to private equity.” This quotation confirms that private equity has become very important for institutional investors. This holds true for other alternative assets as well. The reason behind this is the increasing pressure to attain high rates of return which public equity and bonds alone cannot provide. In times of under-funded pension funds and demographic changes in most industrialized nations, investment manager have difficulties to meet these objectives on behalf of their clients, the retail investors. This reveals that at the very end of a “food chain” stands, as usual, the human being, in this case the individual investor. Investing in private equity is a much more resource-intensive process than investing in public stock due to the opacity of the business. Before investing in a private equity fund, a limited partner usually receives only little information on the particular investment strategy of this fund. And unlike in real estate funds, there is no ability to preview the funds’ assets beforehand since they are in general not yet identified before the launch of the fund. Likewise, there is no possibility to be excused from a particular portfolio investment after the fund is established. Therefore, one can say that the investor is investing in a “blind pool”. Anyhow, the limited partners enjoy limited liability which restricts their maximum potential loss to their initial investment. Moreover, general partners usually invest a significant proportion of their personal wealth in the fund to align interest with the limited partners and create trust. As a result of the active investment style and the confidentiality of much of the information involved in private equity, the task of assessing the relative merits of individual fund managers is more difficult than that of benchmarking mutual fund managers. Selecting investments and then monitoring their performance has become even more complex because investors are seeking higher levels of geographical diversification in their private equity portfolios. They no longer simply invest in the prospective regions where they come from. However, in order to reduce risk exposure to the individual capabilities of a single general partner, limited partners have the choice to invest in a fund of funds. A fund of funds is a pooled fund vehicle whose manager evaluates, selects and allocates capital amongst a number of private equity funds. This can be particularly useful as the minimum investment commitment to a single fund is rather high (often between € 5 million and € 10 million). Thus, investors can diversify across economies, industries and life cycle stages and reduce the risk of their private equity portfolio. The agent of the limited partner is the general partner who manages the private equity fund. His responsibilities start with fund raising and general investor relations. Once the fund is established, the process of selecting potential target companies begins. The evaluation and acquisition of the target company as well as the arrangement of the buyout financing is the core activity of a general partner. The operative management of the acquired portfolio companies is often delegated to interim investment managers which need to be selected and supervised. Towards the end of the investment the general partner is leading the exit process. Since the general partner observes and acts upon the performance of the target company during the investment period, private equity can be considered a very active style of investing. For theses services the general partner is remunerated by the limited partners. In addition to a yearly management fee which normally accounts for 1-2% of the fund’s volume, the general partner participates in the fund’s upside potential via the so-called “carried interest” or just “carry”. This incentive fee is typically composed of 20% of the fund’s total profits. The resulting reward structure equals a call option on 20% of the fund’s value, with an exercise price equal to the limited partners’ investment. According to option theory, the general partners can increase the value of their option by increasing the risk of the underlying, i.e. the portfolio companies in this case. But this imminent conflict of interest between principals and agents is tried to be prevented through the “co-investment”. Most fund managers attempt to capitalize on their knowledge by operating in a specified geographical zone. However, so far, a lot of funds do not specialize on particular industries. The matter of specialization is closely linked to the personal experience and background of the general partners. Most private equity fund managers are former investment bankers, strategy consultants or company executives. Smaller, independent funds founded by individuals often have a more narrow investment focus while bigger, independent funds descending from large limited partners like insurance companies invest across economies and markets. In order to highlight some names I will refer to a recent study by AltAssets (2002), a leading research firm for private equity. According to their survey “Europe’s most highly regarded buy-out firms, as voted for by the region’s leading LPs [limited partners], are BC Partners, Permira, Apax, CVC and Cinven”. In addition to the independent players there are the private equity departments of the multinational investment banks such as Goldman Sachs Capital Partners. However, in a current trend some of these units are spun off because the independent players see a conflict of interest when the investment banks compete against them on certain deals on the one hand and offer them their expensive advisory services on the other hand. The target company is the heart of every LBO since it is the carrier of the operating business. But how do companies decide to become the target company of an LBO? There are five general classes of target companies. First, there are family-owned businesses which are either in need of management successors or have owners who want to sell their parts. In these cases, an LBO can provide the funds to pay off the old owners and, the case given, a new management team can be installed. The second class is constituted of former divisions of diversified companies which are spun off for strategic motives. Third, there are publicly listed corporations which in the eyes of a private equity fund would benefit from being taken private for a while. Thus, sometimes an LBO is attempted against the wishes of the current management or some of the shareholders. A fourth group is composed of state-owned companies which are supposed to be privatized. And finally, any company that has an unfulfilled financing need either for growth purposes or because of a distress situation may decide to search a buyout partner. Assuming the opposite, the investor perspective, what do buyout funds look for in a buyout target? Unless fund management has acquired specific expertise in a market, ideal targets operate in a market whose business model, competition and dynamics are comprehensible. Typically, buyout targets are mature, cash-cow businesses with established markets for their products. According to the trade-off theory of capital structure, these companies are exactly the kind of companies that ought to have high financial leverage. They often have safe, tangible assets, such as brands, machines or real estate, which may serve as debt collaterals and they have plenty of taxable income to shield through tax-deductible interest payments. However, a highly leveraged LBO is only feasible if the target company is currently only decently leveraged. Moreover, an ideal buyout target has little need for investments during the investment period and generates strong and persistent cash flows which allow serving the debt. Capital expenditures, increases in net working capital and acquisitions of other companies are elements of a business plan that alienate buyout funds. In order to pay down the debt and increase the value of the target company during the investment period, an experienced management is needed. The general partner normally sets strong incentives to enhance management performance. These incentives have typically two components: first, management “co-invests” along with the private equity fund and sponsors a (relatively small) equity contribution and second, management participates from the upside potential through warrants, also called “equity kicker”, which allow purchasing additional shares in the company in the future, at a price fixed at the time of the LBO. Thus, conformance of interest in the key relationship in a buyout, i.e. between management and the private equity investor, is supposed to be assured as they share the common goal of maximizing shareholder value. Furthermore, the high leverage itself constitutes a control mechanism as lenders will watch covenants closely and high interest payments prevent management from undertaking unnecessary investments. Any LBO has its own specific dynamics and therefore requires its own specific financing solution. The general partner is not only responsible for the equity side; he also supervises and organizes the whole financing package. For the debt side, the structured finance services of an investment bank are called upon. The structured finance department assumes the responsibility for arranging and syndicating the debt. In larger transactions, parts of the different capital tranches are syndicated to dozens of investors. At the end of this process, the capital structure for the transaction is determined and a detailed financing solution to the general partner is proposed. The proportions of debt and mezzanine applicable in the transaction depend on the cash-generating power of the target company, the collaterals of the target company, the covenants to be placed in the lending contract and the general risk appetite of the investors. In the next three chapters, the three general forms of financing, equity, debt and mezzanine are introduced and analyzed both from the private equity fund’s and the counterparty’s point of view. The most common occurrences of the three forms are portrayed. However, the reader should keep in mind that LBO financing is subject to constant change and that “anything goes” in composing the deal as long as it can be negotiated. One basic principle of corporate finance states that debt is cheaper than equity. Hence, the general partners try to minimize their contribution of equity. However, the running of unacceptable risks is to be avoided and every business has its own maximum debt capacity which depends on the maturity, stability, profitability and nature of the target business. Technical tools such as the debt-to- EBITDA ratio or the interest cover (EBIT divided by interest charges) help to find a reasonable balance by measuring the cash-generating and debt-service capacity. But ultimately, all depends on the lenders’ willingness to provide debt which in turn also determines the equity contribution. The lenders will have their own views on the business, the market and the trustworthiness of the business plan. The more predictable the performance of the business, the higher is the level of maximum debt. Moreover, their risk appetite will be driven by the debt market conditions. Debt markets are cyclical which affects both the terms and quantity of debt available. Nevertheless, a rule of thumb states that equity makes up for roughly one third of the enterprise value on average. The lower the equity contribution, the higher is the risk that interest or principal redemption obligations cannot be met or even that the company’s equity is erased due to negative deviations from the business plan. Therefore, a low equity proportion always bears the risk that the lenders take over the target company. Hence, the general partner and the management attempt to amortize the debt as quickly as possible. On average, buyout funds hold a portfolio company over a three to six year period. The faster a company returns to “regular” debt levels, the faster it can be prepared for the exit and be put up for sale. The resulting pressure to achieve superior results in best time can cause tensions between the general partner, the management and the employees. Now that we have seen how the proportion of debt in the capital structure comes about, a closer look at the different types of debt is taken. In an LBO, debt is usually provided in different tranches which differ with regard to their collaterals, maturity and costs. In the following the most common debt instruments used in buyouts are portrayed. The most basic and straightforward example is the senior term loan with a fixed interest and repayment schedule. Security is a consistent feature of senior debt guaranteed by collaterals in form of the target company’s assets, receivables or revenue streams. Senior debt is used in almost any buyout, often in combination with other forms. Such packages of different layers of debt, with successively lower priority, longer repayment periods, less security and correspondingly higher returns, are referred to as “alphabet debt”. The layers enable the lender to invest according to his exact risk appetite. As buyouts have grown in size, increasingly sophisticated types of loans have emerged. Companies which demonstrate consistently high levels of free cash flow and dispose of valuable and long lived fixed assets, may mandate an investment bank to underwrite and sell securities with a partial right on this cash flow into the market. This newer trend is called securitization. Another example are high-yield bonds which are tradable, unsecured securities. They represent the highest risk (and return) for the lender of all loan types with the exception of mezzanine debt. Financial engineering is very creative at the moment, in particular with debt market instruments and there are constantly new products and variations being “invented”. What needs to be retained from this chapter is that debt is the cheapest form of financing for the general partner although some, often all, of the debt is “junk” that is, rated below investment grade. Therefore, debt used in LBOs is more costly than regular bond issues for example, but comparatively it is cheap. The general partner tries to optimize debt financing by gradually exhausting the possibilities of every tranche. If no more senior debt funding is available, perhaps because no more fixed assets can be used as collateral, more costly unsecured debt is issued and so on. The last option before equity needs to be injected is to tap the mezzanine market. Brealey and Myers believe that investors underestimated the risk of default in junk bonds in the 1980s when these were used to finance the first LBOs. When default rates climbed significantly from 1988 to 1991, LBO debt became more expensive and high leveraging became not only more expensive but also more difficult. But because the LBO equity sponsors did not want to renounce on low equity contributions, financial engineering came into play and mezzanine capital developed. This hybrid form of financing is filling the gap between equity and senior secured debt in the pecking order. Mezzanine ranks below senior debt in a default situation. Covenants are usually similar to those on senior debt, but tend to be more flexible. Any security that combines debt and equity characteristics can be called mezzanine and accordingly there are innumerable variations. The most common form in LBO financing, however, is debt that is issued together with a warrant. A typical mezzanine tranche in an LBO financing package works as follows. The mezzanine investor (also a private equity business as mentioned above) provides capital which he is paid back at the exit of the buyout fund thus constituting a longer redemption period than for senior debt. The investor receives continuous interest payments during the investment period. The interest rate is usually lower than on regular debt but this pure debt part of mezzanine is also less risky because there is a steady cash flow. At the same time, the investor is granted warrants and so-called payment-in-kind (PIK). This technique refers to the accruement of additional debt on top of the initial debt which only becomes receivable at the end of the mezzanine term. This second debt-like feature of mezzanine increases the return for the investor and compensates him for the fact, that his debt is unsecured as opposed to most of the ordinary debt, without compromising on the target company’s cash generating capacity in the beginning of the investment period. The equity-like feature, i.e. the warrant, provides the upside potential at a successful exit. Together all three components add up to a median targeted return of 15% to 20% for this complex security. The buyout fund benefits from mezzanine because the required rate of return is lower than for equity and because cash outflows are postponed until the exit; the mezzanine investor profits from the flexibility of being both lender and potential owner of the business. A buyout structure is not designed for permanence; it is a work in progress whose success cannot be measured until it is completed by achieving an exit. Towards the end of a buyout fund’s life all portfolio investments are “exited” in order to be able to distribute the returns to the limited partners. There are three generic possibilities for doing so. First, a sale to a strategic buyer, a so-called trade sale, may be aspired. Thus, a high price may be achievable if the buyer is willing to pay a strategic premium on top of the stand-alone of the portfolio company. However, not every business is applicable for a strategic merger and target company management may be unwilling to become divisional managers in a new group. The second option consists of finding another buyout fund ready to conduct a secondary buyout. In this case, the second investor must be convinced to realize a further appreciation in value. The third alternative is the going-public of the target company through an initial public offering (IPO). Often regarded as the most elegant form of exit, it is also a rather costly alternative and it usually only allows for a partial exit in the short run. It further depends on the conditions of the IPO markets and on management’s willingness to operate in the public arena. This route is most attractive for companies in need of further growth capital with management teams which wish to remain in charge. Recently, alternatives have become increasingly popular such as recapitalizations where a target company that has accomplished the redemption of the majority of its debt is re-leveraged, i.e. it incurs new debt. The proceeds are then distributed to the equity owners in the form of dividends. Regardless of the exit channel, a buyout fund usually tries to realize the exit as soon as possible to maximize the rate of return for its investors. A limited partner measures his return in terms of internal rate of return (IRR) which increases exponentially with decreasing time between cash outflow at the LBO and cash inflow at the exit. The fact that the bulk of the cash inflow stems from the capital gain arising from the sale of the target company, with a much less significant part arising from the target company’s profits and surplus cash flows, increases the motivation to reduce the investment period. Nevertheless, a trade-off is to be made between an earlier exit and a later exit which leaves more time to increase the value of the target company, thereby facilitating a higher sales price. In the following, the three levers which can be triggered to increase the value of the target company during the investment period are described. Their relative importance has changed from the earliest buyouts until today. Today, financial leverage can be easily arranged. The markets for highly risked debt are well developed and financing alternatives are abundant. Access to this funding is no longer exclusive and a buyout fund only relying on financial leverage would not be able to offer a competitive price in the bidding process for a target. Its investment opportunities would be restricted to cases of exclusive deal sourcing. Strong knowledge of the target market and business which permits implementing changes in the way the company is run, as well as obtaining an attractive exit multiple are the two other important value drivers. The financial lever has historically accounted for around 50% of the value creation in LBOs. Today, its impact is estimated to be 25%. The importance of the exit multiple has increased to 20%. The most influential value driver determining 55% of the value appreciation, however, is the internal value creation within the target company through growth of the business and improvement of operations. This is confirmed through the study by AltAssets (2002) which states that “Buy-out firms now rank their ability to bring about operational change in portfolio companies as the number one way of generating returns.” Nevertheless, financial leverage is still a key component of any LBO. In the following three chapters I will refer to figure 2.2. which demonstrates on an example how the three levers increase value. Debt is not only usually cheaper than equity in terms of the rate of return expected by the investor; it also has another key advantage. Interest payments on debt are tax-deductible. Whereas dividends to shareholders are paid from after-tax profits (net earnings) interest payments are made on the basis of EBIT. Thus, a so-called “tax shield” is provided because the tax burden is reduced by the interest payments multiplied with the tax rate. In fact, the state bears this part of the cost of debt. This is called the fiscal lever of debt. Financial theory proves that theoretically a business should therefore be totally debt-financed. This is not possible, however, as the risk of bankruptcy rises with increased leverage and lenders demand an ascending risk premium. Therefore, any company has an optimal capital structure that minimizes overall cost of capital. Leverage ratios found in LBOs are far more aggressive and exceed the average capital structures seen in comparable, ordinary companies because limited partners accept higher risk on their search for exceptional returns. Furthermore, they have more experience with and better contacts to the debt capital markets. In the example in figure 2.2., the financial lever accounts for 25.0% of the total value creation of 520.0. By increasing the ratio of equity to enterprise value from 35.0% to 67.2% through the redemption of debt, a value of 130.0 has been created. The fact that the NewCo has to pay fewer taxes because it benefits from the fiscal lever adds additional value but is neglected to reduce complexity. Now the most influential value driver is regarded. The operating business can be impacted on three levels. On the strategic level, the buyout itself can already constitute a major change. Buyout targets are often unwanted divisions of larger, diversified companies which strive to focus on their core business. The smaller divisions which suffer from top management neglect and bureaucracy often flower when spun off. A consecutive, strategic repositioning on the market and realignment of the company’s internal organization may create value by stimulating further growth. Thus, a whole new business model may be formed. An expansion through multiple, horizontal or vertical, acquisitions often referred to as a "buy and build" strategy, can either establish a new market leader or a redefined business model. As far as tactical changes, i.e. decisions affecting the mid-term horizon of the company, are concerned, there are several potentially value-creating levers such as reduced capital expenditures, reduced net working capital or the sale of assets. They enhance capital efficiency or improve operations which leads to higher profitability. On the operational level, cost cutting programs and new, more efficient controlling systems can have the same impact. What these operating levers have in common, is that they strive to increase the current and future earning power of the target on the one hand and reduce capital intensity on the other hand. Thus, the two drivers determining return on capital, i.e. return on sales and asset rotation, are tried to be optimized towards the exit. The resulting increased earnings and free cash flows improve the prospects for the company’s business and constitute a sharpened basis for the evaluation of the company at sale. The success of these measures can be explained through the positive rupture in the structure of the organization and the contractual relationship between management and capital providers. Jensen (1989) argues that the significant leverage, the concentration of ownership between management and often only one professional investor, and the control exercised by the lenders produce multiple incentives to manage the firm according to the logic of value creation. The operating lever has determined 55.0% of the value creation in the example in figure 2.2. The rise in EBIT by almost 10% per year from 100.0 to 132.9 over the four-year period has created a value of 286.0 for the equity investors. According to The Economist (2005) in the Wall Street Journal, New York Times and Financial Times, the use of the term "private equity" this year is up by around 60% compared with just two years ago, and by over 3,000% in the past ten years. Very recent approaches against financial investors by some left-wing politicians who occasionally revive class conflict resentments constitute a newer trend. The term “private equity” is often used synonymously with the term “venture capital”. In this paper “private equity” is used as the general term whereas “venture capital” refers to early-stage financing. Every country has its own legal vehicles. In France, Fonds Communs de Placement à Risques (FCPR) or Fonds Communs de Placement dans l’Innovation (FCPI) are often used whereas in Germany the Gmbh & Co KG is most popular. The concept is also related to as „pass-through“ taxation. The European mutual fund industry has recently faced stagnation and in some countries like Germany, assets under management have even declined whereas capital flow into private equity does not stop to grow. KKR: Kohlberg Kravis Roberts & Co. is one of the oldest buyout firms. The nomenclature refers to the famous Principal-Agent-Theory, cf. Jensen and Meckling (1976). Fund of funds have enlarged the investor base so that today private investors also have access to private equity. The segmentation into five groups is based on the aggregation of several sources. In case the existing management team participates in the transaction one also speaks of a management buyout (MBO) while a management buyin (MBI) refers to the opposite case where the general partner acquires the target with an external management team. The combination of both is named BIMBO. The arrangement of a whole financing solution by one investment bank becomes more and more frequent and is referred to as “one-stop-shopping”. Other, less common financing forms such as vendor loans are neglected here. Schaaf (2005) states a current equity ratio of 36%. In order to establish trust amongst the new shareholders and in order to protect the stock from immediate losses through large trunk sales, the existing shareholders often commit themselves not to sell certain parts for a certain amount of time. These figures stem from a study by Ernst & Young. The figures in the example have been chosen in a way that the proportions of value creation match exactly the average proportions found in practice.